I will admit it. I am a sucker for Valentine’s Day. I love any excuse to be all ooey gooey. I understand that some people think it’s a made-up holiday created by the greeting card companies… another day where we are expected to spend money on our loved ones. I don’t care about any of that. I love Valentine’s Day. Historically, my husband has planned some outstanding Valentine’s Day surprises for me. Today was no exception. When I came downstairs this morning, he had prepared a special breakfast for me- toads in the hole is what I used to call it when I was little. 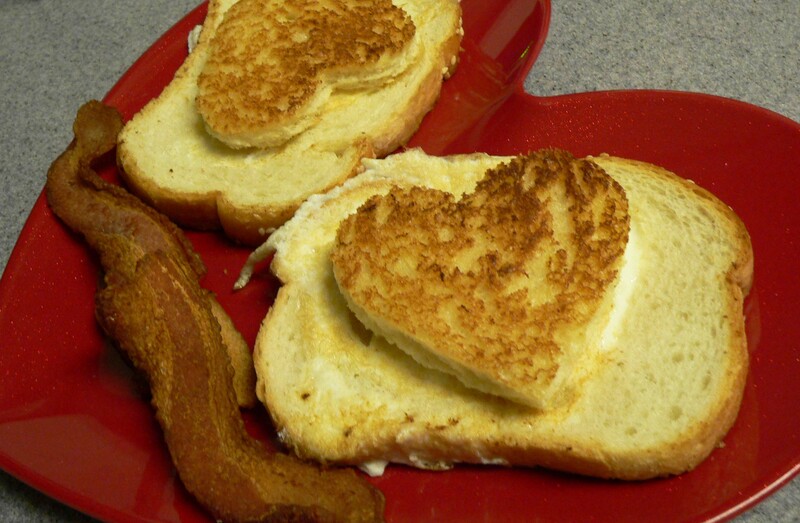 Of course, he made it extra special by making heart-shaped toast… and bacon. We love bacon in this house. Though, who doesn’t? Happy Valentine’s Day! Sweet, thoughtful and delicious…what a combo! Think he’s a keeper. He is something. I think I will keep him.